Life through a glass of Bubbles! Franschhoek (French Corner) is a gorgeous foodie village set in the heart of the Western Cape winelands and easily accessible from Cape Town. It is known as The Gourmet Capital of South Africa and is home to many wonderful restaurants (including Le Quartier Francais, recently awarded 36th place in the Worlds Top 50 restaurants). The village is also surrounded by some fantastic vineyards which dot the spectacular mountains around the village. The Franschhoek Magic of Bubbles 2010 fell on the first weekend in December with the Sunday coinciding with our departure back to cold Ireland. 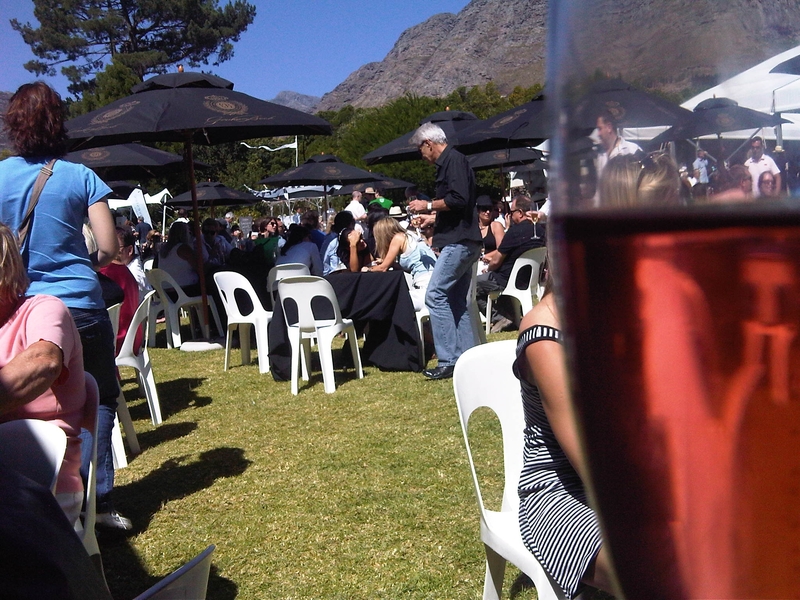 What better way could there be to spend our last day than sipping bubbles in the warm sunshine of beautiful Franschhoek? The South African produced sparkling wine is called MCC – Methode Cap Classique. The quality is generally very good indeed; on a par with most champagnes and, I would say, better than the majority of the prosecco and cava that is available on the Irish market. In South Africa, a bottle of good MCC will retail from the equivalent of about e10 making it an affordable treat with restaurant prices starting at around e18, putting it on a par pricewise with entry level wines at home. The Magic of Bubbles festival is a three day celebration of the MCC industry in South Africa with dozens of the country’s best producers taking stalls and exhibiting their wares. An entrance fee of equivalent to e18 gains you entry to the festival and for that you get a champagne glass and 10 coupons to be redeemed against tastings of both the bubbles and various food offerings provided by the wonderful local restaurants. This is a great way to taste a variety of wines from different producers and it is a wonderful way to spend a day, sipping bubbles in the sunshine and listening to the band play. The coupons do go a long way and seemed to last us the whole day. Of course having spent the previous two weeks working our way around the various vineyards, you do make a friend or two who may allow you a tasting without a coupon!! If you do run out, the bubbles are of course sold by the bottle as well, and at their prices a fun day is assured! If you are planning a holiday in South Africa and will be in or around the Western Cape in early December, you really should consider spending a day at this Festival. We thoroughly enjoyed it! 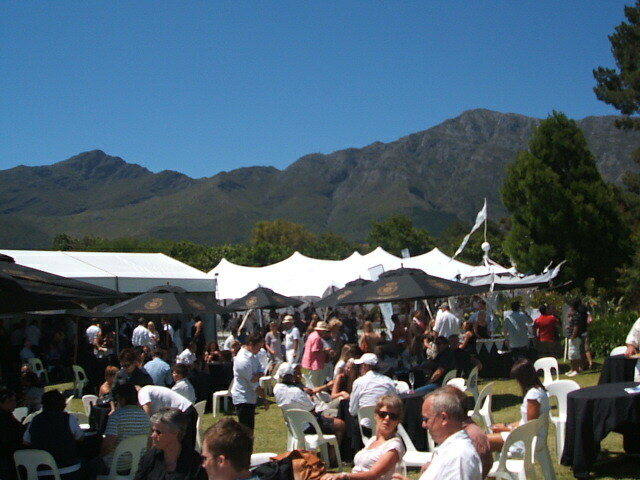 Festival underway, with the gorgeous mountains in the background. As a postscript, as far as I know MCC is not imported into Ireland. I wish it was – anyone reading who can help?